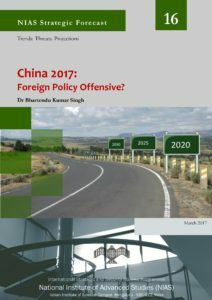 China 2017: Foreign Policy Offensive? To cite: Bhartendu Kumar Singh. “China 2017: Foreign Policy Offensive?,” NIAS Strategic Forecast No. 16. Bangalore: International Strategic and Security Studies Programme, National Institute of Advanced Studies, March 2017. Forecasting Chinese foreign policy is a problematic child and can often go horribly wrong! One example would suffice. Sometime in 2010, a defence journalist had predicted that China would attack India in 2012. Today, seven years down the line, all of us know how bad prognosis it was! Even though more and more predictable scientific tools are being resorted for forecasting, social science research, by its very nature, is all about past and not future. This paper, therefore, would attempt to draft the possible contours of Chinese foreign policy in some select areas only since it is not possible to discuss the entire gamut of Chinese foreign policy trajectory. About the Author: Bhartendu Kumar Singh is in Indian Defence Accounts Service.